Rotary District 6080 has ~ $20,000 District Designated Funds (DDF) available for beneficial use in the polioplus program during 2012-2013. 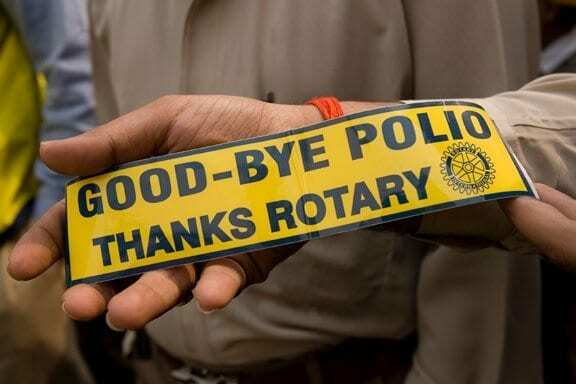 Checks for individual and club polioplus contributions should be made payable to ‘The Rotary Foundation’. Do not write ‘polio’ in the memo line or anywhere else on the check. Contributions received will be deposited in The Rotary Foundation (TRF) Annual Programs Fund (APF) while District 6080 will deposit an equal amount of $DDF into TRF PolioPlus Fund. Therefore the same amount of polio vaccine will be purchased while yet crediting the contributing individual with donor recognition for ‘Every Rotarian, Every Year; Rotary Foundation Sustaining Member; Paul Harris Fellow; Paul Harris Society. One-half or ~$10,000 DDF will be returned through the SHARE program to District 6080 in 2015 for funding District Simplified Grants (DSG), Matching Grants (MG), Scholarships, etc. Contribution checks should be submitted together with a completed ‘The Rotary Foundation Transmittal’ form found on DaCdb, Reports, 2.1. Mail to: Raymond E. Plue District Rotary Foundation Chair 2805 Butternut Ct. Columbia, MO 65201-3538. The program will continue until the $20,000 is exhausted after which polioplus contributions will be mailed directly to TRF PolioPlus Fund.